All of the different Spider-People seen in the movie. Spider-Man: Into the Spider-Verse, was recently released to critical acclaim. So far, critics have praised it for its creativity and bold art style. Unlike your typical animated film, this movie is styled like a comic book. In all of the settings of the movie, you will notice lots of hand-drawn lines and dots, which was a common method of quickly shading backgrounds in old comic books. But that’s not all, the movie goes a step further with its animation. It combines art from across comic book history. The plot of the story centers around the idea of multiple Spider-people from different dimensions coming into one universe. Each of these dimensions in the story is actually based off of one of the many different Spider-Man comics. The animation described in the first paragraph only applies to the dimension in which the story is set. Since some of the characters are from different dimensions, they have different looks to go along with their comics. A few of the characters look very similar and only have minor differences. The protagonist, Miles Morales, lives in a world based off of the “Ultimate Spider-Man’ series of comics, so he is animated in the same way as the world around him. “Spider-Gwen,” also known as the Spider-Woman, is animated in a nearly identical fashion to Miles as their comics were released around the same time. Then there Peter B. Parker, the Spider-Man from the classic Spider-Man comics that we all know and love. He takes inspiration from the original comics that were made back in the 60s. While characters like Miles have the same animation style as the world around him, a few of the characters stand out from the world. Like Peni Parker, who is based on Japanese Manga. She is animated like an anime character. She has large, expressive eyes to show emotion and has plenty of vibrant colors in her robotic spider-suit. But there are also characters that look completely out of place, like Peter Porker, the Spider-Ham. Spider-Ham has an over the top, cartoonish look, hailing back to the days of Looney Toons. Finally, there is Spider-Noir, a completely black and white Spider-Man in a stereotypical detective getup. He can’t see any color at all and is styled like old detective comics that were popular before the days of superhero comics. 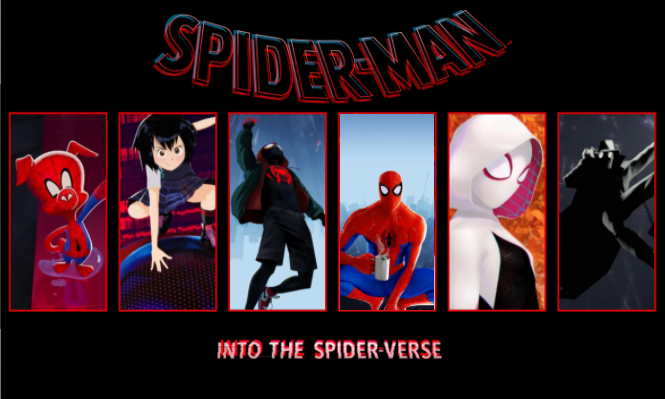 By taking risks with its animation, Spider-Man: Into the Spider-Verse has managed to stand out amongst other animated films. Couple that with a good plot, interesting character arcs, and believable characters, and you have yourself a great film. This is one of the best films of 2018 and I implore you to watch it if you haven’t already.